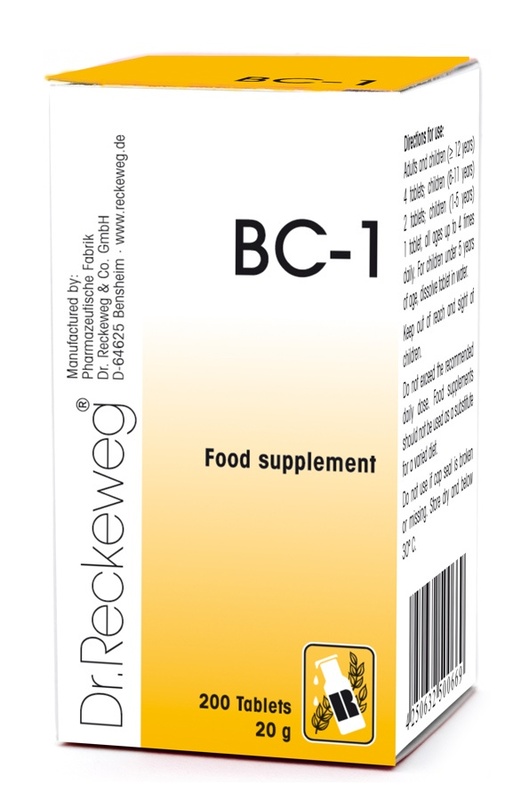 Dr Reckeweg BC-1 200 Tablets - BULK OFFER! <b>*</b> <b>FOR AN OVERVIEW</b> ON THE MEANINGS OF ALL THE SCHUESSLER SALTS <b>VISIT OUR BLOG</b> - <a href ="https://schuesslertissuesalts.wordpress.com/2013/06/25/the-individual-and-combination-schuessler-tissue-salts""><b>CLICK HERE.</b></a"></a><br> <br> <b>Suggested Dosage:</b><br> 0 to 1 year: 1 tablet<br> 1 to 6 years: 2 tablets<br> 6 t0 10 years: 3 tablets<br> 10 years and older: 4 tablets<br> <br> Take four times daily, at intervals of 3 hour<br> <br> <b>Ingredients:</b> <br> Calc phos, Ferr phos, Kali phos, Nat mur.<br> <br> Cell salt medicines should not be used for long periods without medical advice and usage should be stopped once symptoms improve.<br> <br> For infants, dissolve in some warm spring water.<br> <br> In order to increase the success of the treatment, if at all possible try to avoid taking coffee, tea, alcohol, tobacco, and mint (toothpaste, chewing gum, cough drops, etc.) during your treatment. Also avoid inhaling strong substances such as chemical products and strong detergents.<br> <br> Schuessler salt tablets should be allowed to dissolve under the tongue. The salts are lactose based (milk and sugar). <br> <br> <b>Caution:</b><br> Keep out of reach of children. Do not use if camp seal is broken. Use only as directed. If symptoms persist consult your healthcare professional. * FOR AN OVERVIEW ON THE MEANINGS OF ALL THE SCHUESSLER SALTS VISIT OUR BLOG - CLICK HERE. Calc phos, Ferr phos, Kali phos, Nat mur. Cell salt medicines should not be used for long periods without medical advice and usage should be stopped once symptoms improve. For infants, dissolve in some warm spring water. In order to increase the success of the treatment, if at all possible try to avoid taking coffee, tea, alcohol, tobacco, and mint (toothpaste, chewing gum, cough drops, etc.) during your treatment. Also avoid inhaling strong substances such as chemical products and strong detergents. Schuessler salt tablets should be allowed to dissolve under the tongue. The salts are lactose based (milk and sugar). Keep out of reach of children. Do not use if camp seal is broken. Use only as directed. If symptoms persist consult your healthcare professional. Send Us Your Review of Dr Reckeweg BC-1 200 Tablets - BULK OFFER!